Rene Lalique Bowl Coquilles: About 24 cm round overlapping shells decorated molded glass R. Lalique Bowl selling in the same Lot No. 292 with a handful of unrelated items. Model: 3200 Circa 1924. 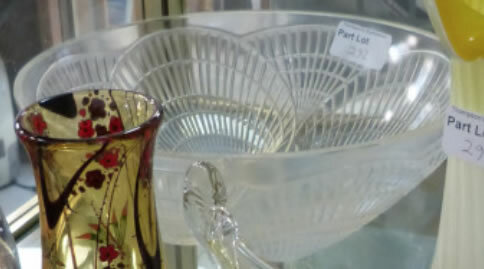 Note: The size and therefore the model number of the bowl are our best guess based on the photo you see here. UK - England - Harrogate - Killinghall - Lund Lane info@thompsonsauctioneers.com +44 01423 709086 Date of Sale: 2019-04-12 Thompsons Auctioneers (Harrogate) Ltd.